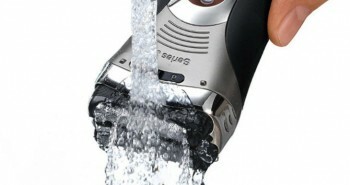 Philips thinks of the shaving and trimming needs for men, women, and even children. 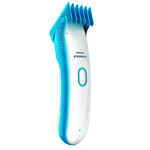 You can purchase the Philips CC5060 Kids’ Clipper to trim kids’ hair. This clipper is a smaller version than the ones for men. It provides a safe and easy way to trim your son’s hair at home, without a lot of expensive trips to the barber. This clipper is also cordless and rechargeable, but it can’t be used wet. The Philips CC5060 comes in an attractive shiny white plastic casing with aqua blue sides. There is a blue comb at the top and an oval on/off power button on the front. The Philips Norelco logo is just located above that. There is a green power-on indicator at the bottom front of the Philips CC5060. There are also two different combs so you can choose which length you want to trim your child’s hair to. With the two combs you have the choice of 15 different length settings. The combs will adjust to different hair lengths up to 1.65 inches. Once you choose the best length setting the comb will be locked into place. It will then stay in position as you do an even trim around your child’s hair. Not only does it stay safe but your chid gets to have a professional haircut. There will be no more estimating lengths with a pair of scissors, and your child won’t be embarrassed attending daycare or school with an uneven haircut. There is also the option to run it with the cord or without. This means you’ll never get stuck if you forget to add the batteries. 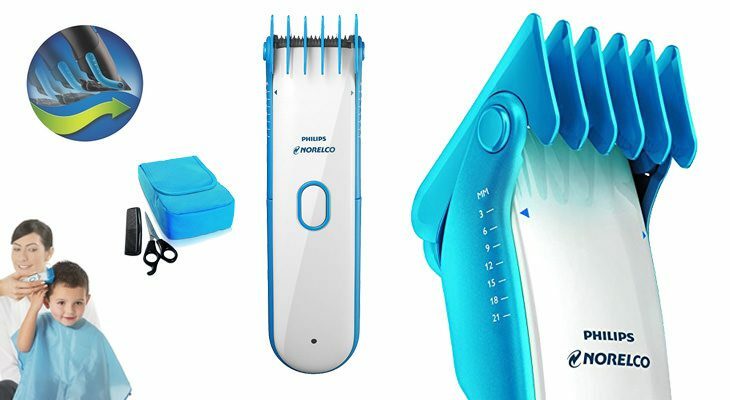 In your kit you’ll also receive a Philips Norelco DVD to help you trim your child’s hair. It’ll also show you how to have a funner hair cutting experience for both you and them. 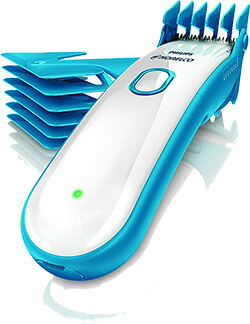 This clipper is more compact and lightweight than an adult clipper. It’s also made for women’s hands, as likely moms will be the ones who are doing more of the trimming of kids’ hairstyles. This will also enable moms to more easily maneuver the clipper around a child’s head. Mom will not tire when holding this clipper in her hands. What’s nice about the Philips CC5060 is that it’s quiet. This can be an important concern as younger children may get scared when having their hair cut. A quieter clipper can keep you and your kids calm as the Clipper has a quiet motor. The comb has kid friendly designed tips. This means that they’re rounded so they’ll never scratch or cut your child’s skin. The rounded tips will protect the skin and give a comfortable cutting experience. It’s easy to maintain these clippers. They don’t need any special conditioning oil. The blades are also self-sharpening, so you don’t have to worry about having to replace them every few weeks. And sharp blades means that the clippers will always work efficiently. You can create all sorts of children’s hairstyles with these clippers, including buzzcut, long sports cut, the fade, and curly haired styles. The clipper is designed to be simple, so you won’t have to juggle a lot of different parts around. 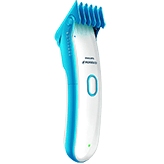 The clipper works cordless with the aid of a powerful lithium ion battery. It takes eight hours to fully charge up, which will give you 45 minutes of run time. This is enough for about three haircuts, so if you’ve got three kids, you can get all their hair trimmed in one session. 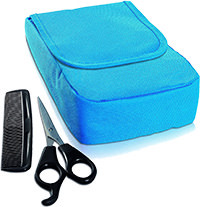 In the box you’ll get one Philips CC5060 Kids’ Clipper, black handled scissors, a black comb, the how-to DVD, a cape, and a blue carrying pouch. There is also a two year Philips warranty on this product. The box measures 3.7” x 6.8 x 9.8 inches and weighs one pound. Reviews are favourable at 4.2 out of 5 stars. The Philips CC5060 costs around $75, which will be more than worth it once you add up all the money you’ve saved for several months. Are you ready to save money on your kids’ haircuts? 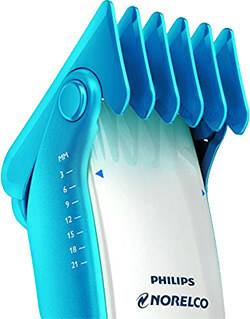 The Philips CC5060 Kids’ Clipper is the perfect choice for your bathroom grooming kit.